currently we have two dry docks at the KSEW that need to be increased to AT LEAST four so that it enables us to at least be able to work on two new construction and one dock for maintenance while the fourth one spared as back up/emergency or in case there is increased need so a third project can be started there. If we want to MODERNIZE our navy building one ship at a time than God help us! The development of Gwadar as a ship repair port is extremely important,whether that happens is another question since it would cut into business of Nawaz Sharifs freinds the Dubai Sheiks. Minister for Finance Ishaq Dar said on Thursday the shipbuilding industry has a huge potential due to long deep-sea shores of the country. Chairing a meeting to discuss a proposal for building new shipyards along Pakistan’s coasts, he said in line with the true potential and ideal location, the shipbuilding industry could contribute to national economic development and poverty alleviation. He said in the last eight months the industrial sector had performed well and it was the vision of the PML-N government to make Pakistan a country that could prosper and develop as per its potential. He said it was the responsibility of the government to attract investment in key industrial projects like shipyards as major triggers for further industrial growth. He assured full support of the Ministry of Finance to the Ministry of Defence Production for the projects, which could help generate economic activity and attract foreign expertise and investments. He stressed the need of training and utilising the human resource, which would contribute to employment opportunities and increased per capita income. Chairman Ship Building Association Vice Admiral (R) Iftikhar Ahmad Rao gave a presentation on the global shipyard industry and emphasised that nations which realised the importance of their seas benefitted and became great powers. He said the maritime sector was a prime source of growth, employment and social cohesion in developing countries. According to him, the world GDP grew at an average of 3.6% per annum whereas sea trade grew 4.3% per annum in the last 50 years. In other words, world’s GDP grew eight times whereas sea trade grew 13 times in the last half century. He said China started shipbuilding in the 1990s and today it was the global leader with a 41% share, followed by South Korea and Japan with 33% and 20% share respectively. There are over 1,000 shipyards in China and even India has over 100 shipyards. In comparison, Pakistan has only one shipyard, the Karachi Shipyard and Engineering Works with two small dry docks. He underlined the deep-sea shores, abundance of labour force and strategic location as Pakistan’s advantages in comparison to other regional countries. Pakistan's naval modernization program appears stalled, with no discernible progress being made on efforts to modernize and expand the surface and sub-surface fleet. This comes amid moves ensure the security of the deepwater port of Gwadar, and fears of mass obsolescence vis-a-vis arch rival India. Gwadar is the start of the China-Pakistan Economic Corridor (CPEC) to link western China to the Middle East and Africa through Pakistan. It will carry commercial goods and energy resources, slashing the time to ship goods to China via the Malacca Straits and South China Sea. For Pakistan, ensuring maritime security has been of increased concern. Earlier this month, a newly raised battalion of Marines began protecting Gwadar. Author, analyst, and former Australian defense attache to Islamabad Brian Cloughley says this was probably through extra enlistments due to the Marines "already being stretched in commitments." Ensuring Gwadar's defense has been the theme of recent exercises. A domestic series of drills, Seapark, was held in November and December. A series of recent bilateral exercises with China's Navy have also been held, the third of which concluded on Tuesday off the Pakistani coast. It aimed to protect sea lines of communication and the CPEC by improving coordination and interoperability at operational and tactical levels. Chinese ships consisted of two Type-054A frigates (Liuzhou and Sanya) and a replenishment ship (Qinghaihu). Pakistan participated with warships, helicopters, patrol and fighter aircraft, plus special forces. Air defense, boarding, communication, and joint maneuver drills were carried out. However, the need to ensure seaward defense of Gwadar has exposed the apparent lack of progress in the Navy's modernization program. The frontline fleet currently consists of three Agosta-90B/Khalid and two Agosta-70 submarines, plus four F-22P/Zulfiquar, one Oliver Hazard Perry, and five ex-British Type-21/Amazon class frigates. Pakistan has negotiated the purchase of eight AIP-equipped submarines from China, finalizing the deal in October. This was reportedly followed by a domestic frigate and fast attack boat-building program with Chinese assistance. This latter program was also to include upgrades to the current F-22P class frigates, Pakistan's most modern and capable surface ships even though they are only marginally better than the remaining frigates in being able to protect themselves from missile attack. Cloughley believes time is running out. "It seems that the emphasis for the moment is on developing the submarine arm of the Navy, but it is essential for Pakistan's security that it acquire more surface ships, and that a decision on number and type be made this year." Nothing has as of yet been signed however and despite request for clarification by Defense News there has been no official word on any progress or the programs' status. This pales in comparison to India, which is fast modernizing and expanding its naval power. Sam Bateman, an adviser for the Maritime Security Programme at S. Rajaratnam School of International Studies in Singapore, said, "Pakistan has already fallen far behind India in terms of maintaining a level of conventional deterrent/operational effectiveness, and is at risk of falling even further behind." Bateman, who previously served in Australia's Navy outlines a course of action similar to the stalled modernization program. "In broad terms, the [Pakistan Navy] has three requirements: frigates, submarines and fast attack craft," he said. "Looking at its current force structure, my priority for force development would be submarines," he said. "The existing submarine fleet is far short of being an adequate or credible deterrent force. The deterrent value of submarines, as well as their utility for covert surveillance and intelligence collection operations, points to the importance of the [Pakistan Navy] building a credible force." Therefore Pakistan's "top priority" must be to finalize the submarine deal with China. Though much emphasis by analysts has been on the state of Pakistan's frigate force Bateman believes the next priority should lie with fast attack craft. "In a conflict situation, these would be the major surface assets of the [Pakistan Navy]." Pakistan is currently building further examples of the Azmat class stealthy fast attack craft, but has is believed to be considering something more potent. News of Pakistan's interest in the Chinese Type-022 'Houbei' was first reported in June. Speaking at the time, Tom Waldwyn of the International Institute for Strategic Studies expressed surprise. 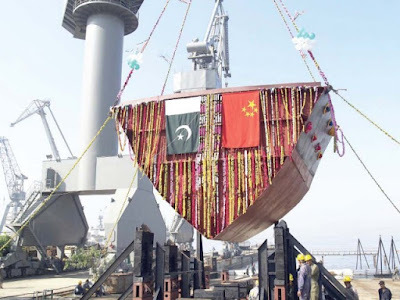 "It would be surprising if Pakistan, or indeed any country, signed a deal to purchase new Type-022s as China stopped production of these vessels several years ago. So any purchase of Type-022s would almost certainly be secondhand vessels," he said. Adding, "These types of vessels are more suited to littoral environments where they can attack opposing ships at high speed and fire off a barrage of anti-ship missiles. If Pakistan were to acquire these ships that is likely to be how they would be employed." The state of the frigates has attracted most attention however. "The current frigate force is just adequate for the [Pakistan Navy's] peacetime requirements, notably sovereignty protection and participation in international coalition and peacekeeping missions, such as the counter-piracy task forces in the Gulf region", said Bateman. Ideally, he believes two to three further Perry class frigates would help matters "to build up its frigate force to about eight vessels, if the updated F-22P vessels can't be acquired quickly." However, entrenched hostility toward Pakistan in the US Congress essentially rules this out, and Cloughley believes Pakistan has no real alternatives. "China is the obvious supplier, as it is unlikely that the US Congress would approve transfer of any surplus vessels, and in any event the US and European countries are concentrating on India as regards provision of military material." As for the Type-21 class frigates they are essentially obsolete and Bateman says they "should be scrapped." Modernization of Pakistan's airpower however could help mitigate some of the Navy's shortcomings, especially with the JF-17 Thunder now entering service. "The JF-17 can carry anti-ship missiles, and it is probable that when the present aircraft of 8 Squadron at Masroor are retired, then they will be replaced by a maritime strike version of the JF-17", said Cloughley. The JF-17 already equips No. 2 Squadron also based at Masroor, and can carry a brace of C-802A/CSS-N-8 Saccade anti-ship missiles. The military has enumerated successful tests of various missiles by the army and navy, arrangements for the security of the China-Pakistan Economic Corridor (CPEC) and targeted strikes by the air force on militant hideouts in support of operation Zarb-i-Azb among its accomplishments during 2016. According to a message released on social media by the Inter-Services Public Relations (ISPR) director general on New Year’s Eve on Saturday, an enhanced version of the Babur cruise missile and the indigenously produced air-launched Ra’ad missile were successfully tested during the year. The navy test-launched the shore-based anti-ship missile Zarb and fired a surface-to-surface anti-ship missile in the North Arabian Sea from the Sword Class Frigate PNS Aslat. Arrangements for the actualisation and security of the CPEC, consisting of an 870km road network and raising of a Special Security Division and Task Force 88 for its maritime security were carried out. According to the ISPR, the navy proved its vigilance and operational preparedness by detecting and blocking an Indian submarine from entering Pakistani waters south of the country’s coast. 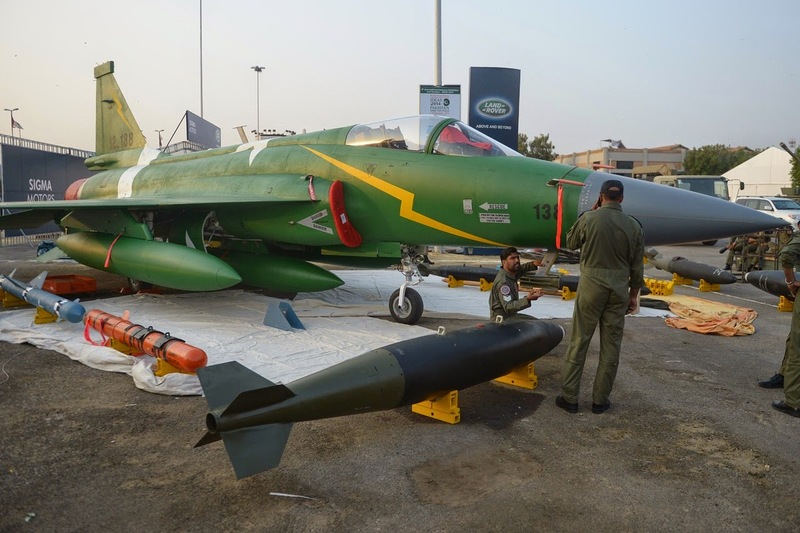 Also during the year, the groundbreaking of an air power centre of excellence was carried out to enhance PAF’s capacity to meet future challenges and undertake counterterrorism operations. The Pakistan Air Force’s C-130 won the best aircraft trophy at the Royal International Tattoo Show in the United Kingdom. India's Aircraft Carriers: A Giant Waste of Time? Can they really be used in a war against Pakistan? At this juncture, let us revisit the Pacific War. During this conflict, William Halsey of the U.S. Navy was the archetypal aggressive and offensive-minded carrier admiral. His polar opposite, Raymond Spruance, was restrained and more adverse to risk. Hence, the big question is: In a future conflict involving carriers, would the leadership be in the mold of Spruance, the “Quiet Warrior”? Or would a “Bull” Halsey hold sway? The risk of losing a capital asset could play on the minds of the leadership, and it might take an existential threat to the homeland for carriers to be sent into a nonpermissive environment. Hence, it is likely that leaders, whether military or political, would deploy the vessel in a manner more akin to Spruance than Halsey. It is worth noting that there has not been a direct clash-of-arms between great powers since World War II. Moreover, there has not been a major campaign at sea for over 30 years since the Falklands War. With very few reference points, any future conventional maritime campaign is likely to be cautious, with the side having the more valuable assets taking more probing actions. Deterrence favors the A2/AD-centric nation in such circumstances. Though carriers have not been in a high-end fight since 1944, there is evidence of them being deployed more cautiously in combat during the Cold War. In the 1971 Indo-Pakistani War, India’s carrier, the Vikrant, was sent to the permissive Bay of Bengal and not to the more contested northern Arabian Sea. Similarly, during the 1982 Falklands campaign, the Royal Navy kept its two carriers farther from the area of operations than usual for fear of reprisals from Argentine airpower. It also bears notice that these two episodes occurred before the coming of age of precision-guided munitions and what the Russians termed as the reconnaissance-strike complex. The Pakistan Navy has conducted another test-firing of what appears to be a shipborne variant of an indigenously developed cruise missile. The weapon was fired from its latest Azmat-class patrol craft, PNS Himmat (1027), in the North Arabian Sea, the Pakistan Armed Forces' official media communications group known as the inter-services public relations (ISPR) office revealed on 23 April. In January 2018, Himmat conducted a similar test-firing of the weapon. On both occasions, the ISPR office stopped short of disclosing the type of missile used in the firings, only noting that it has anti-ship and land-attack capabilities, and that the weapon has been developed in-country. The test announced in April 2019 was also described as one that has "accurately hit its target on land", but no further details were given on this, including the type of target deployed, and its distance from Himmat at the time of firing. Images of the launch released by the ISPR office suggest a weapon length of between 6 m and 7 m, when taken in relation to Himmat 's overall beam. Based on its visible markings, it is probable that the missile is the 'Harbah', which is shipborne variant of Pakistan's indigenously developed Hatf 7 (Babur) short-range cruise missile. Pakistan is known to be pursuing air-, ship-, and submarine-launched variants of the Babur cruise missile to complement its line-up of longer-ranged ballistic missiles.